Fiesta-Si.com • View topic - Guide: Which Air Filter Setup Should I Choose? 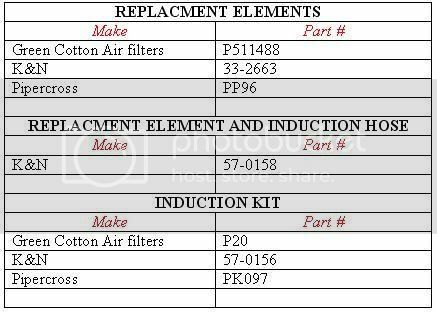 Post subject: Guide: Which Air Filter Setup Should I Choose? Should I go for a panel filter replacement or open air filter? When you are opting to replace the standard air filter, you are spoiled for choice on not only the route you can take, but also the products available. The most popular brands to go for are K&N, PiperX, and Green, all of which have proved themselves in the world of air filters and induction, and whichever one you go for will not disappoint. However, once you have decided which brand you want to upgrade to, you then have the choice of replacing the standard filter with a panel filter, or going for the full induction kit. Both have their plus points and negatives, so it's down to you as to which you go for. Let's start with the panel filters. A good panel filter will improve the amount of air passing through your air intake system, and reward you with better throttle response, whilst keeping the standard airbox. This is the easiest method as the only thing you need to change is the air filter. By going with this method, you also prevent the issue of heatsoak which is the major problem with open air cone filters. As far as an improvement in induction noice goes, you won't really see or hear any noticeable difference. Should you wish, however, you can modify the standard airbox by drilling a series of 5mm holes underneath where the filter sits, and ideally opposite the engine so as to prevent heatsoak. This will improve induction noise slightly. Next, you have the choice of an open air, cone filter. These are a little more commonplace on modified cars, and offer slightly better gains in terms of bhp and induction noise. But, the main problem with the cone filters is the fact that if there is no additional protection by means of some kind of heatshield, the cone filters can suffer dire heatsoke problems, especially in the summer on hot days. Should you find yourself stuck in traffic, the heat build up in the engine bay can seriously compromise the effectiveness of the filter. An attempt to combat this can be achieved with a combination of further modifications. The first is to surround some of the air filter with a heat shield blocking off the hot air generated by the engine. This is usually a custom job so not a lot of people have tackled this problem, although there are a few examples to be found if you look hard enough. The second thing that should be done is introduce the air filter to a cold air feed. This is achieved by using a length of flexible piping (the K&N kit comes with this) which can be routed from the front of the car and directed to the filter itself. This ensures a constant cold air supply to the air filter when driving. There are many ways to mount the cold air feed to maximise the amount reaching the filter. The first and easiest is the direct it to the bottom of the engine bay, pointing forward, to draw up cold air. Then you have the option of removing the passenger side fog light, and using that as the point for cold air to enter. A very good finish can be achieved and it sometimes looks almost factory fitted. The same can be said for those who have Morettes fitted - by removing the inner light, this is then a superb point to mount your cold air feed. An added bonus of buying a K&N induction kit is the addtional crossover pipe supplied. This is a curved rubber intake pipe which connects your MAF to the inlet manifold, and offers slightly better air travel on it's way to the inlet. The standard pipe has near enough a 90 degree bend for the cold air to negotiate, as therefore is restrictive somewhat. However, should you wish to buy either a Green or PiperX cone filter, the K&N rubber pipe can be found to accompany these aswell. Please note that you should not to use the ERST cross over pipe as that restricts air flow to a degree. Typically you'll see a few flat spots ironed out with an aftermarket filter of any kind though, which should make your power curve somewhat cleaner. Power figure wise aftermarket filters will increase your BHP ever so slightly, though the change in torque increase/decrease can differ from car to car with an open air filter compared to a Replacement filter. As ever though, it is only slight, and nothing to worry about in the grand scheme of things. Please see below for part numbers. Many Thanks to mattyboy for providing us with this. If you have any questions, or wish to offer your own thoughts or experiences on this subject, then please reply. Post subject: Re: Guide: Which Air Filter Setup Should I Choose? i have a panel filter but i have "modified" the air box on the cold side! Pics up in members soon but all i have done is grind out a section of the box on the cold side, which will soonbe accompanied by a feed! Loud and sounds great, with no heatsoak issues of a cone! My K&N filter element with drilled holes in my mk4 pulled better than my aftermarket filter, sounded louder and looked much better if you like the standard/stealthy look. I'm on the side of modified panel filter with extra air feed for N/A cars. Don't fix what ain't broke! ive got a kn panel filter with a drillied airbox which has a cold air feed dont think thats standard but it looks like it could be lol i dno. To try and get some specific answers to whats best, im hopeing to get my 2LSi back on a rolling road in the next few weeks and get a run back to back with a standard airbox then pipercross cone filter and finally a replacement Hi flow element eg K&N, just waiting for a cheep one to come up on ebay! will post the results as soon as done. ive added my findings on my results of fitting both panel filter and cone filter against standard filter in the guides section. Are the air filters you have listed also compatible for the 1.4? PS I have a photo of my si in my pictures and want to add it to my signature? Can you please advise me how? k&n cossie cone filter for me, its a big mofo!! Seemed to make a massive difference on my GTi but that has a stupid intake system. I think it worked on the torque but for outright pace it just strangled it. I gained about 15bhp from a de-cat and filter. The Clio has a valve that opens under the right conditions and opens up the second inlet tract. Or some fancy balls anyways, basically the standard system is the best!